Located at the foot of Tatipu Hill in the northern suburb of Lhasa, the Sera Monastery is one of the three famous monasteries in Lhasa together with the Drepung Monastery and the Ganden Monastery. 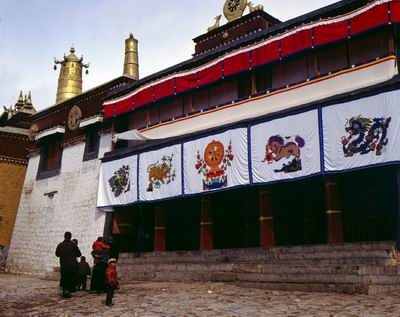 It is also one of the six monasteries dedicated to the Gelugpa or Yellow Hat Sect, which is a branch of Tibetan Buddhism. Sera Monastery was first built in 1419 and finished in 1434 in Ming Dynasty (1368-1644). In Tibetan, "Sera" means wild rose, it is so named because the hill behind the monastery was covered with wild roses after it was built. Covering an area of nearly 115,000 square meters, the magnificent monastery is mainly composed of the Zhacang (college), Kamcun (dormitory) and Coqen Hall. There were over 8,000 monks living in the monastery in its heyday. Its scale ranks next to Drepung Monastery. The debating of Buddhist doctrines is the highlight of Sera Monastery. Besides, the Shoton Festival (June 30 to July 6 in Tibetan calendar) and the Buddha-Unfolding Festival is also held in the temple.